With its rich and fertile rural land, the South Devon region produces plenty of fresh fruit and vegetables, fine free-range meats and outstanding dairy produce, not to mention the abundance of seafood. When visiting this region, a stop at one of the farmers’ markets offers the opportunity to taste the delights of local foods, see what’s in season and what the locals are buying and perhaps have a natter with members of the local community. In each town, the local farmers’ market usually operates on a certain day of the week and the timing and location can change. If you intend visiting any of the Farmers’ Market on your South Devon holidays, they advise that you contact them in advance to double check times and location. Held on alternate Saturdays, the farmers’ market sells local produce and delicacies. Opening Times: 08:30 – 13:30. 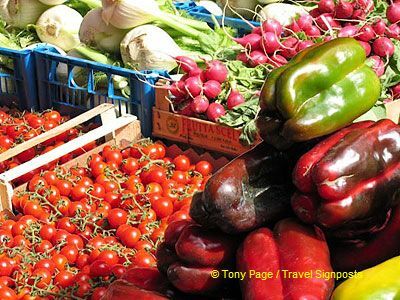 Buckfastleigh market occurs every Thursday and offers a huge range of produce, including fresh fruit and vegetables, meat and dairy produce, preserves, craft items, organic bread and a range of organic and fair trade products. Here you can sample Westcountry’s famous cheeses including goat and sheep’s milk cheeses. Opening times: 09:00 – 13:00. Dartmouth Farmers’ Market occurs every second Saturday of the month at The Old Market. Opening times: 09:00 – 13:00. Kingsbridge Farmers’ Market is held on the first and third Saturdays of each month in the town square. Seasonal vegetables and fruit are on offer along with freshly baked delicacies, cheeses, smoked goods, chillies, chocolates and hampers filled with local produce. Opening times: 9.00 – 13.00. Newton Abbot’s Farmers’ Market runs every Tuesday and can be found in Courtenay Street, a pedestrianised street in the town centre, This market prides itself of its reputation for product quality and a variety of fresh produce and here you’ll find eggs, cheese, bread, pasties, pork, fruit and vegetables, chutneys, jams and preserves. Opening times: 09:00 – 15:00. Teighmouth Market occurs on Saturdays and offers a range of local produce from South Devon. Opening times: 09:00 – 13:00.